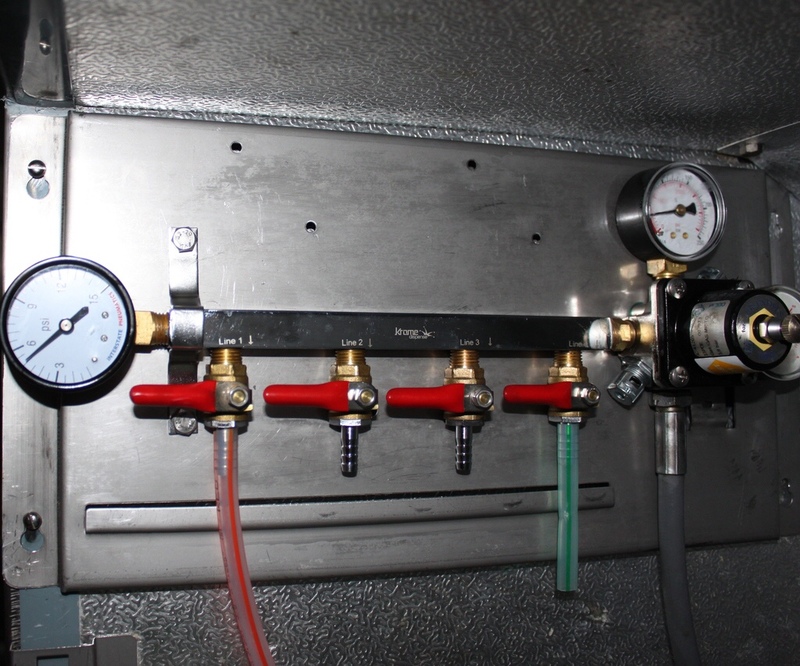 I am thinking of doing a kegorator with a 3 corney keg set up, what I want to know is, what to use for regulating the gas to 3 different pressures, is there something which has 3 dials and allow you to set different pressures. I have seen a dual regulator but not a triple, just doing a wish list and want to price things up before I go ahead. Just be aware that they are not 3 primary regulators, you have to cascade the three pressures to equal or less on each. The Britvic style ones are totally independent but you normally only get 3 take offs, although I have seen some before with more (essentially built in manifolds). Both work but just something to be aware of. Not sure I understand exactly what foobar is saying. I have one, essentially as I understand it, they consist of a primary regulator which sets the pressure on the first gauge and outlet. This is often set to say 20 psi for carbonation. This can then be stepped down for the next gauge and single outlet. The 20psi, still from the primary, then continues on to the last gauge and the final 4 outlets which can again have an independent pressure. WHICH COULD EVEN BE HIGHER, than the first secondary gauge and single outlet. In effect you can run three separate psi pressures, one of which has 1 outlet, another has 1 outlet and the last has 4 outlets. Thanks, I am still trying to get my head around the whole gas pressure thing. I wrote the following on another forum site, so have cut and pasted it here. Might provide useful information? First you have your CO2 bottle which is often the 6.35Kg "pub" bottle. 6.35Kg is covenient, but don't be fazed by size: With CO2 the management systems are identical as long as you have the correct attachments (you can use "sodastream" type bottles if you don't wont big "pub" bottles). Handling big cylinders is no different from small cylinders, but big cylinders have the potential to do more damage if you do anything daft! Some brewers use fire extinguishes but these might have to be modified or used upside-down ... all a subject for another thread. It's not as complicated as it looks !!! Plenty on the web and here on Jims. This is a US site but on first glance seems to go through the whole Kegerator set up issues. To put CO2 gas regulation at it basics. Gas Bottle is at very high pressure, potentially lethal if the primary regulator not there!!! 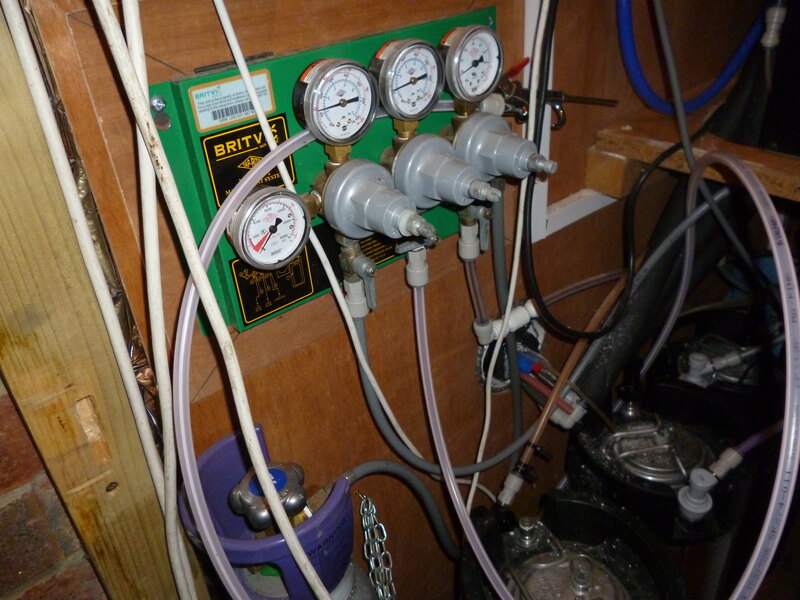 The primary regulator steps this pressure psi or bar to a reasonable pressure say 20psi to force carbonate a keg. This would likely be too high for serving. But if psi was then turned down, this primary regulator could be used for dispensing. But that for most of us would just be for one keg or cornie. Now a secondary regulator, and there could be many, one of these for any number of kegs, will step down the primary regulator pressure to whatever you need for each cornie or keg. EG perhaps 10psi for a fizzy lager or just 2psi top blanket pressure to not over carbonate a traditional British bitter ale. mine came from another source..
you can probably make out the Britvic brand name on the lable and they often appear on ebay with this or cocacola in the ebay listing. as they are usually/originally used to feed the syrup mixing/carbonating equipment used in bars for soft drinks. and generally go for circa £50+ tho ive not been keeping much of an eye on them lately.. Yes they are robust and give a three different psi output as does the original board, bu seriously more industrial grown up secondary's!!!!! dont quite follow, but one 'feature' of the 3x inline primary type i have that is common with the old welders reg i used before, is that fine tuning to a low pressure level suitable for a low/moderate conditioned beer with a short feed to its tap is a NIGHTMARE, the coarse gradient of the dial 2/4 sometimes even 5psi per mark isnt that helpful. As i have no experience with 2ndary regs i cant comment on how easy they are to set in the 2-6psi range, but i suspect they are not the pita my 3x primary jobby can be.. Thanks once again all,I will no doubt have to re read these posts to take the info in, interesting the article on gas management, I will trawl e-bay and have a look at what is around. Ah yes, I see, hadn't realised the Britvic boards were just three primaries. In that case I would definitely prefer the board Haydenexport has where the first dial and output is the primary. The gauges on the Britvic boards vary, the ones on mine have a good range on but I have seen ones that are next to useless. Are you saying on the Cola boards that all the the settings are totally independent of the others (I was always told that they "cascaded" so it wasn't possible to go to a higher pressure than the previously set one (I've never tried it myself on my board). It isn't the coarse gradient of the dial that confounds you. It's the entire mechanism. At one end you are expecting it to hold back the output from an Ariane 5, and at the other end a gnats' fart. Just not going to happen. In fact I find a lot of "secondary" regulators are pretty sticky trying to manage even 7psi. Diaphragm devices are better than "piston" ones. My preferred secondary regulator at the moment is the Shako NR200 (the yellow topped 0-2BAR version), although I have seen a few other manufacturers doing similar things. They easily adjust down to 2-3psi and are filthy cheap. Variable LPG (secondary) regulators fill in the 0.75-2.25psi range. These are supplied by my "primary" regulator (which many folk use as thier only regulator) permanently set at 3-5BAR. I was also told this when I bought mine, and may have repeated that knowledge too.. but it turned out to be slightly inaccurate. One outlet is from the primary regulator and so yes, this should be noticeably higher pressure than the others (since the secondary regulators benefit from some headroom to work with). But my secondaries were actually independent from each other - their apparent series connection was in fact just a pass-through (EDIT: Haydnexport's ebay picture looks the same). So the seller had been incorrect, and it took quite a while for me to notice that! One other thing to consider with soft-drinks and welders regulators is that their pressure relief valves are usually a higher value than on a regulator designed for beer - or even missing completely. Some systems or kegs have other means of protection, but not all do so it isn't impossible that the PRVs on re-purposed regulators are quite a lot higher than the safe working pressure. Last edited by Kev888 on Sat Apr 07, 2018 7:21 pm, edited 1 time in total.